Not to be confused with red mung bean. The mung bean (Vigna radiata), alternatively known as the green gram, maash, or moong Sanskrit मुद्ग / mudga, is a plant species in the legume family. The mung bean is mainly cultivated in East Asia, Southeast Asia and Indian subcontinent. It is used as an ingredient in both savory and sweet dishes. Phaseolus trinervius Wight & Arn. Vigna sublobata (Roxb.) Bairig. & al. The English word mung, correctly pronounced as 'moong', originated (and used as is) from the Hindi word मूंग ("moong"), which is derived from the Sanskrit word मुद्ग ("mudga"). Mung beans are one of many species recently[when?] moved from the genus Phaseolus to Vigna. The species is still often incorrectly cited as Phaseolus aureus or Phaseolus radiatus. Mung beans are commonly used in cuisines across Asia. Although whole mung beans are also occasionally used in Indian cuisine, beans without skins are more commonly used; but in Maharashtra, Gujarat, Kerala and Tamil Nadu, whole mung beans (called pachai payaru பச்சை பயறு in Tamil and cherupayar ചെറുപയർ in Malayalam) are commonly boiled to make a dry preparation often served with rice gruel (kanji கஞ்ஞி). Dehulled mung beans can also be used in a similar fashion as whole beans for the purpose of making sweet soups. Mung beans in some regional cuisines of India are stripped of their outer coats to make mung dal. 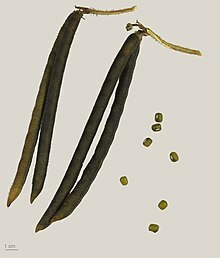 In Bangladesh and West Bengal the stripped and split bean is used to make soup-like dal known as Moog dal(মুগ ডাল). In the South Indian States of Karnataka, Tamil Nadu, Telangana and Andhra Pradesh, and also in Maharashtra steamed whole beans are seasoned with spices and fresh grated coconut in a preparation called "Pesalu" పెసలు in Telugu or Usli in Kannada or Sundal சுண்டல் in Tamil or "Usal" उसळ in Marathi. In Chinese cuisine, whole mung beans are used to make a tángshuǐ, or dessert, otherwise literally translated, "sugar water", called lǜdòu tángshuǐ, which is served either warm or chilled. In Hong Kong, dehulled mung beans and mung bean paste are made into ice cream or frozen ice pops. Mung bean paste is used as a common filling for Chinese mooncakes in East China and Taiwan. Also in China, the boiled and shelled beans are used as filling in glutinous rice dumplings eaten during the dragon boat festival (端午節). The beans may also be cooked until soft, blended into a liquid, sweetened, and served as a beverage, popular in many parts of China. In Korea, skinned mung beans are soaked and ground with some water to make a thick batter. This is used as a basis for the Korean pancakes called Bindae-tteok (빈대떡). In the Philippines, ginisáng monggó (sautéed mung bean stew), also known as monggó guisado or balatong, is a savoury stew of whole mung beans with prawns or fish. It is traditionally served on Fridays of Lent, when the majority Roman Catholic Filipinos traditionally abstain from meat. Variants of ginisáng monggó may also be made with chicken or pork. Mung bean paste is also a common filling of pastries known as hopia (or bakpia) popular in Indonesia, the Philippines and further afield in Guyana (where it is known as black eye cake). In Indonesia, mung beans are also made into a popular dessert snack called es kacang hijau, which has the consistency of a porridge. The beans are cooked with sugar, coconut milk, and a little ginger. Mung Pakon, traditional Bengali Pitha, Bangladesh. These sprouts have been transferred from a similarly-shaped colander in which they had been grown with moisture. They are ready to be cooked. Mung beans are germinated by leaving them in water for four hours of daytime light and spending the rest of the day in the dark. 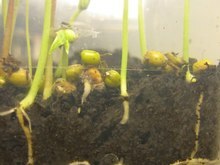 Mung bean sprouts can be grown under artificial light for four hours over the period of a week. They are usually simply called "bean sprouts". However, when bean sprouts are called for in recipes, it generally refers to mung bean or soybean sprouts. Mung bean sprouts are stir-fried as a Chinese vegetable accompaniment to a meal, usually with garlic, ginger, spring onions, or pieces of salted dried fish to add flavour. 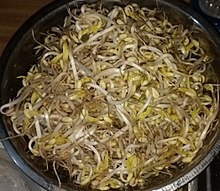 Uncooked bean sprouts are used in filling for Vietnamese spring rolls, as well as a garnish for phở. They are a major ingredient in a variety of Malaysian and Peranakan cuisine, including char kway teow, hokkien mee, mee rebus, and pasembor. In Korea, slightly cooked mung bean sprouts, called sukjunamul (hangul: 숙주나물), are often served as a side dish. They are blanched (placed into boiling water for less than a minute), immediately cooled in cold water, and mixed with sesame oil, garlic, salt, and often other ingredients. In the Philippines, mung bean sprouts are made into lumpia rolls called lumpiang togue. In India, mung bean sprouts are cooked with green chili, garlic, and other spices in the state of Gujarat. In Indonesia the food are often used as fillings like Tahu Isi (stuffed tofu) and complementary ingredient in many dishes such as rawon and soto. In northern China and Korea, soybean sprouts, called kongnamul (hangul: 콩나물) in Korean, are more widely used in a variety of dishes. The "blue sprouts" are toxic since they contain small quantities of hydrogen cyanide, like potato sprouts do. Mung bean starch, which is extracted from ground mung beans, is used to make transparent cellophane noodles (also known as bean thread noodles, bean threads, glass noodles, fensi (粉絲), tung hoon (冬粉), miến, bún tàu, or bún tào). Cellophane noodles become soft and slippery when they are soaked in hot water. A variation of cellophane noodles, called mung bean sheets or green bean sheets, are also available. In Korea, a jelly called nokdumuk (hangul: 녹두묵; also called cheongpomuk; hangul: 청포묵) is made from mung bean starch; a similar jelly, colored yellow with the addition of gardenia coloring, is called hwangpomuk (hangul: 황포묵). In northern China, mung bean jelly is called liangfen (涼粉, meaning chilled bean jelly), which is a very popular food during summer. Jidou liangfen is another flavor of mung bean jelly food in Yunnan, in southern China. The mung bean was domesticated in Persia (Iran), where its progenitor (Vigna radiata subspecies sublobata) occurs wild. Carbonized mung beans have been discovered in many archeological sites in India. Areas with early finds include the eastern zone of the Harappan Civilisation in modern-day Pakistan and western- and northwestern India, where finds date back about 4,500 years, and South India in the modern state of Karnataka where finds date back more than 4,000 years. Some scholars, therefore, infer two separate domestications in the northwest and south of India. In South India, there is evidence for the evolution of larger-seeded mung beans 3,500 to 3,000 years ago. By about 3500 years ago mung beans were widely cultivated throughout India. Cultivated mung beans later spread from India to China and Southeast Asia. Archaeobotanical research at the site of Khao Sam Kaeo in southern Thailand indicates that mung beans had arrived in Thailand by at least 2,200 years ago. ^ "The Plant List: A Working List of All Plant Species". Retrieved 13 January 2015. ^ According to the Oxford English Dictionary, 2nd ed., the main spelling in English is "mung", but moong is also used, and mungo is recorded. "Moong"(मूँग) called in hindi in different rural area of Uttar Pradesh in India. "Bean" is not always appended. They are often sold as "moong". ^ "The World's Fastest Dictionary". Vocabulary.com. Retrieved 2011-06-29. ^ "Mung bean | Define Mung bean at Dictionary.com". Dictionary.reference.com. Retrieved 2012-08-22. ^ Tomooka, N.; Vaughan, D. A.; Moss, H.; Mixted, N. (2003). The Asian Vigna: genus Vigna subgenus Ceratotropis genetic resources. New York: Kluwer. ^ Fuller, D. Q.; Harvey, E. (2006). "The archaeobotany of Indian Pulses: identification, processing and evidence for cultivation". Environmental Archaeology. 11 (2): 219–246. doi:10.1179/174963106x123232. ^ Castillo, Cristina; Fuller, Dorian Q. (2010). "Still too fragmentary and dependent upon chance? Advances in the study of early Southeast Asian archaeobotany". In Bellina, B.; Bacus, E. A.; Pryce, O.; et al. (eds.). 50 Years of Archaeology in Southeast Asia: Essays in Honour of Ian Glover. Bangkok/ London: River Books. pp. 91–111. ISBN 9786167339023. Wikimedia Commons has media related to Vigna radiata. "mung bean Vigna radiata". Integrated Taxonomic Information System. "mung bean Vigna radiata var. radiata". Integrated Taxonomic Information System.